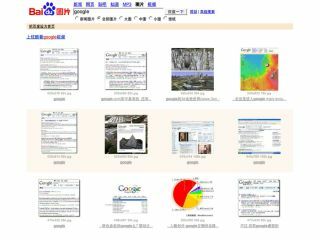 Baidu's search engine plays nicely with Google from the West, but what about within China? On the internet, it pays to take most of what we read with a pinch of salt, particularly when emotive issues involving subjects like democracy and freedom of speech are involved. Accordingly, it brings us no pleasure to report the peculiar case of Google's Chinese hijacking that never was. Late yesterday, various English-language blogs, most notably TechCrunch, were reporting that users inside China trying to access Google's main Chinese search website and a host of other major Western-operated sites there were been redirected to China's leading search engine Baidu. As is usually the case with such hot-button issues, accusations of foul play by Baidu in stealing Google's traffic soon spread across the blogosphere and to mainstream news outlets. However, there was a small problem - the hijacking probably didn't happen at all. Websites featuring the news quickly filled up with commenters falling into two categories - those in the West keen to berate the evils of Chinese censorship and those actually in China who seemed to be having no trouble using the 'affected' sites. Independent checks have since verified that the original story, which relied on a few reports and featured a user-submitted screenshot, was at best mistaken and at worst completely wrong. Experts now say that two explanations for the 'hijacking' are possible - either the original report came from the user of a PC compromised by malware that redirected traffic to Baidu or the Chinese government has ramped up its usual censorship measures. Given the current high-profile of the Dalai Lama, the latter seems the most likely cause of a blanket redirect. Whatever the cause of the problem, it's now clear that Baidu did little or nothing to provoke the tidal wave of antagonism heading its way from our side of the internet pond.